We tell Wright State's story—news, events, culture, and everything in between. We can share your stories across our campuses and beyond. Communications staff write press releases, pitch stories to members of the local, regional, and national media, and staff events when media are expected to attend. Communications staff write stories for both internal and external audiences that post to the Wright State Newsroom. Most Newsroom content also posts on wright.edu and is shared on university social media channels. 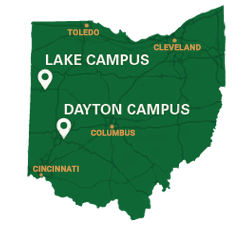 Communications staff are responsible for sending critical campus-wide messages on Wright State Alert, and important updates from university administration and timely notices from Wright State Police on the Official email list. Access your Wright State Alert account through WINGS Express under the personal information tab. Communications staff also send non-emergency campus-wide WINGS emails. Please use WINGS email request form to submit a wings email request. Communications staff share Wright State news, stories, and information on the Twitter feed @WrightStateNews and YouTube. Some content is also shared on Wright State’s Facebook page, @WrightState Twitter account, and Wright State’s LinkedIn page, all of which are managed by the Office of Marketing. Communications staff produce news-style videos that often post to the Wright State Newsroom. Wright State University students spent their spring break on a pilgrimage to historical sites associated with the civil rights movement. Wright State’s women club bowling team won its first national championship since 2015. Searching for a photo from a campus event? Need help creating a brochure, program or flyer? Looking to get website or social media advice? Monday–Friday, 8 a.m. – 5 p.m.